A prototype of Altaeros Energy's high-altitude wind turbine in Maine. Startup Altaeros Energy is going up for more energy. with others to build and test a commercial-scale turbine. capture the stronger and steadier winds at high altitudes. Others include Makani Power, Joby Energy, and Windlift. Skystream turbine, which is normally placed on a pole, inside a helium-filled shell. and was lifted to 350 feet. power than a typical tower-mounted one, according to Altaeros Energy. airborne turbine, which was attached to a towable trailer. competitive and easy to setup from a shipping container,"
to capture wind over 1,000 feet, he added. product of locations that rely on diesel generators. That could include military bases or remote off-grid industrial sites or villages. Longer term, it hopes to deploy its inflatable turbines offshore. for heavy communications and radar equipment. As traditional fossil fuel energy sources dwindle and increase in price, renewable energies become a more attractive prospect and more cost competitive. Geothermal energy, whether used to produce electricity by driving a turbine, or used directly for heating, has considerable potential for growth due to its ability to consistently deliver energy. This new report explains how the market will develop as a multi-billion dollar sector, revealing geothermal energy developments throughout the world and including regional or country specific forecasts and analysis for both the electricity and direct use parts of the market. This report covers all the major companies involved in the industry and includes the latest contract developments, newest partnerships and the most significant technological advances. A wealth of data is analysed to provide a clear breakdown of how the geothermal energy market will develop over the next ten years. The report includes 158 tables and graphs quantifying the geothermal energy market in detail, and includes two original interviews with companies involved in geothermal energy. In addition, the report provides a SWOT analysis of the strengths, weaknesses, opportunities and threats facing the market over the next ten years, and offers profiles of 23 leading companies involved in the geothermal energy industry. The various drivers and restraints of the market are evaluated in order to provide readers with specific insights into the future direction of the geothermal energy market. This visiongain energy report will be valuable to those already involved in the geothermal energy market or to those wishing to enter this important market in the future. A relatively new* type of reciprocating wave-powered electricity generator called Searaser has been developed and is moving forward. Searaser, acquired by Ecotricity, is not a typical wave power plant. The first peculiarity is that it does not generate electricity out at sea. Due to the fact that waves move up and down in the ocean, they can continuously move a float attached to a reciprocating pump that can pump water through a water-powered onshore electricity generator for the sake of keeping the electrical parts of the system out of the water. A prototype of the Searaser has already been tested successfully. Another benefit of the system is that the energy produced could be stored in reservoirs and released for later use, helpful given the increasing amount of intermittent renewable energy going on the grid. Wave-powered generators are a member of the family of hydroelectric power plants, which all use the movement of water to generate electricity. But it’s obviously a bit different than the hydroelectric power technologies you’re used to, isn’t it? Much like nuclear fusion, wave power always seems to be at least ten years away. The basic idea of using ocean waves to produce electricity may be simple, but the execution isn’t. The sea has a tendency to thrash the devices we stick in it, including tethered buoys that generate electricity as they bob up and down. But a study released Thursday by the U.S. Department of Energy suggests wave power remains a dream worth pursuing. Especially in California. Wave power devices stationed along California’s long coastline could generate up to 166 terawatt hours of electricity per year, according to the study, if those devices were placed in the water above the outer continental shelf. Wave power buoys would generate a little less, about 129 terawatt hours, if stationed above the inner continental shelf, in waters no more than 50 meters deep. For comparison, the United States as a whole uses 4,000 terawatt hours of electricity each year, according to the Energy Department. The California Independent System Operator, which manages the electricity grid for 80 percent of California, says its territory uses about 225 terawatt hours per year. Tidal power too could benefit the state, although not to the same degree. A related study released by the Energy Department on Thursday looked at the energy-generating potential of harnessing ocean tides at key “hotspots” across the United States, including the Bay Area’s Golden Gate. Using underwater turbines to tap the Gate’s strong tidal currents was a pet project of former Mayor Gavin Newsom. It went nowhere. The Energy Department estimates that Golden Gate tides could generate a maximum of 178 megawatts of energy. A megawatt is a snapshot figure, roughly equal to the amount of electricity used by 750 typical homes at any given moment. While it isn’t trivial, 178 megawatts is far less electricity than many of the large solar power plants under construction in California will be able to generate. It also pales in comparison to the 18,239 megawatts of tidal power that Alaska’s Cook Inlet could produce, according to the Energy Department study. (Reuters) - China's Premier Wen Jiabao will visit three key Middle Eastern oil and gas suppliers -- Saudi Arabia, the United Arab Emirates and Qatar -- from the weekend, amid signs that Beijing wants to expand its options in the face of U.S. sanctions aimed at Iran. The Chinese Foreign Ministry said on Tuesday that Wen would meet host leaders, including Saudi Arabia's King Abdullah, to "thoroughly exchange views on developing bilateral relations and on international and regional issues of common concern." Wen's six-day trip comes while Iran faces tightening Western sanctions over its nuclear program. Beijing faces pressure to go along with the U.S. sanctions by cutting what it pays for Iranian oil, if not the volume it buys. China already cut oil imports from Iran in January and February in a dispute over contract terms, and has been looking for alternative supplies. Wen's talks are sure to cover, at least in general terms, energy cooperation with his Middle Eastern hosts, said Lin Boqiang, director of the China Center for Energy Economics Research at Xiamen University in east China. "On any visit to the Middle East, these issues will be discussed," Lin told Reuters by telephone. "Generally, there will be something that comes out of a visit like this, because a visit by a premier is not your average visit," he said of discussions on oil and gas. China bought a combined 1.15 million barrels per day (bud) from these three nations in the first 11 months of 2011, customs data showed, nearly a quarter of its total crude imports. President Barack Obama recently authorized a law imposing sanctions on financial institutions that deal with Iran's central bank, its main clearinghouse for oil exports. Treasury Secretary Timothy Geithner was due to arrive in Beijing late on Tuesday for talks that were likely to cover the banking sanctions against Iran. The threat of U.S. sanctions could be a worry for China, the biggest buyer of Iranian oil, followed by India and Japan. Only Saudi Arabia and Angola sell more crude than Iran to China. "Correctly speaking, it's not a matter of China necessarily reducing imports (from Iran), but of looking to increase imports from elsewhere," said Lin from Xiamen University. "China, as well as Japan and other big oil consumers, is already turning its attention elsewhere," he said. China has backed U.N. Security Council resolutions calling on Iran to halt uranium enrichment activities, while working to ensure its energy ties are not threatened. But China, which as a permanent member wields a Security Council veto, has criticized the United States and European Union for imposing separate sanctions on Iran and said they should take no steps reaching beyond the U.N. resolutions. On Tuesday, a Chinese Foreign Ministry official, Chen Xiaodong, repeated that opposition. The unilateral sanctions "are damaging normal trade dealings between Iran and some other countries," Chen, director-general for Middle Eastern and north African affairs, told an online question-and-answer session hosted by the China Daily (www.chinadaily.com.cn). The Chinese announcement did not mention any possible energy or investment deals during Wen's six-day Middle East trip. But on Sunday, Saudi Arabia's state oil giant, Saudi Aramco, said it would sign a final deal next week to build a 400,000 barrel-per-day (bud) oil refinery in Yanbu with China's Sinopec Group. Wen's trip, which starts in Saudi Arabia, was planned long before the recent ructions over Iran, but will give Beijing an opportunity to consolidate ties with major Arab partners, said Li Guofu, director of the Center for Middle East Studies at the China Institute of International Studies in Beijing. "Definitely these three countries are major suppliers of oil and gas to China, and how to increase this kind of cooperation would be a major a topic whenever they meet," said Li. Aramco said the formal signing of its deal with the Sinopec Group would take place on January 14 in Dharma, the site of the state company's headquarters. Under the initial agreement, Aramco will hold a 62.5 percent stake in the joint venture formed to develop the project, and Sinopec will own the rest. Sinopec is the parent of top Asian refiner Sinopec Corp.
Saudi Arabia is already China's top international source of crude oil. In the first 11 months of 2011, it supplied China with 45.5 million tonnes of crude, a rise of 12.9 percent over the same period in 2010. Angola and Iran were the second and third biggest suppliers. Qatar is a major supplier of liquefied natural gas (LNG) to China, and in the first 11 months of 2011 it shipped 1.8 million tonnes of LNG to China, a rise of 75.9 percent over the same period in 2010. But Lin, the professor from Xiamen University, said China would not turn solely to other Middle Eastern countries, which might also be vulnerable to regional tensions, to bolster any downturn in crude orders from Iran. "We certainly can't simply rely on other Middle Eastern countries," he said. "To cope with the Iran problem, we'll probably have to draw more on orders from countries around China, and not just the Middle East." Japan's top oil developer Inpex Corp. has decided to withdraw from development projects in Iran's Azadegan oil field, and the firm has begun making final arrangements for the pullout with the Japanese government, according to government sources. The move will mean the oil developer will not be listed as a company subject to U.S. sanctions over Iran's nuclear program. However, the sources insisted the decision was simply a business decision by Inpex. The government holds the largest share in the firm. The withdrawal will press japan--which wants access to oil fields it has helped develop--to redefine its energy strategy and resource diplomacy in the Middle East. Inclusion in the list of firms subject to the U.S. sanctions would prevent Inpex from doing business with U.S. financial agencies, meaning joint developments with U.S. firms would have to be called off. The sanctions would also negatively impact Inpex's development projects elsewhere in the world. Inpex and the Economy, Trade and Industry Ministry have asked the U.S. government to remove Inpex from the sanction list. As Inpex will likely be taken off the list before it is announced Friday, the firm moved forward with its withdrawal from the Iran oil project. The government sources said Wednesday that the withdrawal was decided because "iran is asking [Inpex] to invest more in the project, but [the Azadegan project] has several risks." However, it is expected to take a significant amount of time for the government and Inpex to negotiate the withdrawal with iran. The Azadegan oil field in southwestern Iran is said to have one of the world's largest oil reserves of 26 billion barrels. A development contract signed in 2004 with the National Iranian Oil Company gave Inpex rights to a 75 percent stake in interests related to the oil field. However, the development project stalled because of issues surrounding Iran's nuclear program, and Inpex's stake in the project was reduced to 10 percent in 2006. 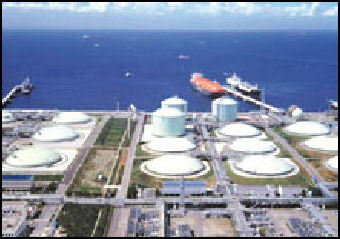 Oil storage tanks Japan is the third largess oil consumer after the United States and China. It relies on oil for about half of its energy needs. Oil consumption in 2002: 1. 935 billion barrels, compared to 7.2 billion barrels in the United States. Japan has dozens of large oil storage tanks for a strategic oil reserves that could keep Japan going if imports were suddenly to dry up. It has stockpiles of 570 million barrels enough to last for 172 days. The demand for petroleum products in projected to fall by 16 percent between 2010 and 2015 as result of aging population, declining population and environmental awareness. kerosene vending machine Japan is the world's second largest importer of foreign oil. Japan uses about 4.5 million barrels of oil a day, and 99.7 percent of Japan's oil is imported. Much of the oil industry is controlled by the state-owned Japan National Oil Corp.
As 2004, Japan got 90 percent of its oil from the Middle East, compared with 86 percent in 2003 and 70 percent in 1991. Japan pays $1.50 a barrel for shipping costs from the Middle East. About 80 percent of Japan’s oil exports pass through the Straits of Malacca. Sources of oil in 2006: 1) Saudi Arabia (31.1 percent); 2) United Arab Emirates (25.4 percent); 3) (Qatar 10.2 percent); 4) Iran (11.5 percent); 5) Kuwait (8.2 percent); 6) Indonesia (2.8 percent); 7) Sudan (2.9 percent); 8) Oman (1.5 percent); 9) Iraq (1 percent); Other (4.8 percent). Japan gets much of its oil from Saudi Arabia and the United Arab Emirates. In Japan, there are worries that UAE will give preferential treatment to China. In December 2007, Japan said it would lend $3 billion to debt-ridden Abu Dhabi as part its effort to secure a reliable supply of oil. 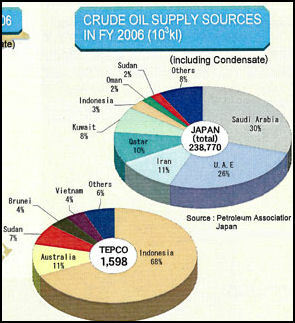 In 2004, Saudi Arabia promised to supply Japan and South Korea with oil no what the situation was on the world market. In return Saudi Arabia wants help from Japan and South Korea developing infrastructure in Saudi Arabia. In December 2008, Nippon Oil, Japan’s largest oil distributer, announced it world merge with the Nippon Mining to form the world’s 8th largest oil company and the 4th largest company in Japan. The new company will have $130 billion in combined sales and a 33 percent share of gasoline sales in Japan, double its nearest rival, Exxon-Mobile. Nippon Oil was created by the merger of Mitsubishi Oil and Nippon Oil in 1999. It operates 10,000 Eon gas stations and has 12,700 employees. Nippon Mining operated 3,500 Jomo gas stations and has 10,000 employees. Impex Corp. is Japan’s largest oil exploration company. It is 29 percent owned by the government and has annual sales of around $10 billion to $20 billion. In October 2010, ExxonMobile announced it was pulling out Japan . It had been considering the move since 2005 because of declining demand for gasoline and light oil as a result of increased energy efficiency and use of fuel-stingy cars, . 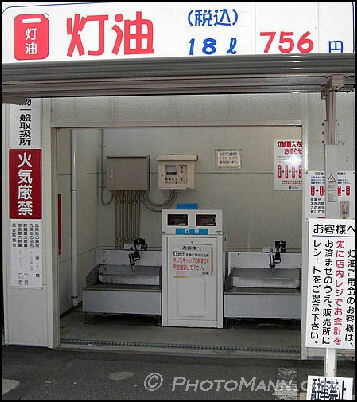 The company operated gas stations in Japan under names Esso, Mobile and General. These were sold on an area by area basis. There is a good chance that refining operations will also be sold in the future. Japan has large refining capacity. It exports light diesel oil to China, Taiwan and Singapore and kerosene to the United States. JX Holding is Japan’s largest oil company. It has refining capacity of 1.8 million barrels a day, as of 2008. It reduced its output to 1.4 million barrels a day in 2010. It has 8 refiners, at one time they reached 90 percent of capacity. As of 2010 they were operating at around 70 percent of capacity. As gasoline consumption has declines, Japan has had to reduce it refining capacity as demand falls and is stuck with a glut of gas stations. Around the same time JX Holding, Japan’s largest oil company, said it mulling closing its Negishi Refinery, one of the largest such facilities in Japan with a capacity of 270,000 barrels. It too cited shrinking future demand. Japan is the world’s largest importer and consumer of natural gas, importing 97 percent of its supplies. Natural gas is used to fuel power plants and in home for cooking and heating. Japan wants to shift even more from oil to natural gas, increasing the percentage natural gas of total energy consumption from 13 percent to 23 percent (2002). The price of natural gas in Japan is more double the price in Europe and almost four times that of the United States. Japan is the world’s largest importer of LNG. It has about a 100 LNG power plants. There are LNG facilities around Tokyo Bay, Osaka Bay, Kitakyushu and other places. Some worry about the catastrophic impact of an LNG tanker explosion. Sometimes LNG tankers pass very close to densely populated areas and heavily industrialized areas. Japan gets between 20 percent and 40 percent of its LNG from Indonesia. It wants to strike a deal with Indonesia to ensure the supply is stable. Starting in 2011, Indonesia plans to reduce export to Japan to less than one forth of current levels to meet increased domestic demand. Qatar has abundant natural gas reserves but is notorious for trying to make as much money as it can from its gas. Supplies from Sakhalin, Russia are delayed from 2008 to spring of 2009 and those from Gorgon, Australia may but not arrive until 2012. Japan is helping to develop gas fields in Britain, Iran Vietnam and elsewhere in Southeast Asia. Osaka gas has developed a portable device that can transform natural gas extracted from offshore oil wells into naphtha liquid fuel and hopes to begin sales of the device around 2015. Transforming natural gas into naphtha cuts greenhouse emissions and helps companies make money from gas they would normally burn off. Natural gas extracted from land-based oil wells is typically transported by pipelines and then used. On offshore there usually is no alternative but to burn it off. LPG ship Japan's LNG imports began rising at a record pace in 2011 as utilities ramp up gas-fired power generation to offset a near-record low in nuclear plant utilisation in the wake of the Fukushima radiation crisis. 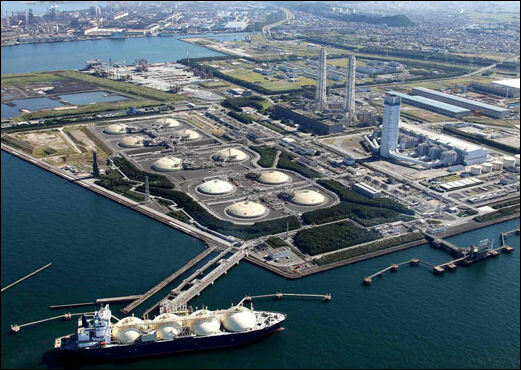 In August 2011, Reuters and Kyodo reported: Osaka Gas Co , Japan's second-biggest city gas distributor, said it would build one of the world’s largest liquefied natural gas (LNG) tanks at its Senboku LNG terminal 1 to meet rising demand for natural gas. The company aims to start construction of the tank with capacity of 230,000 cubic meters in September 2012 and complete it in November 2015. It will cots between ¥10 billion and ¥20 billion. The tank will 60 meters high and have an external diameter of 90 meters, making it almost as long as a football field, and will be able to store the annual consumption of 330,000 households. Terminal 1 handled 1.1 million tonnes of LNG in the year ended in March, the company said in a statement. Tokyo Gas intends to expand its LNG business because utilities are expected to step up thermal power generation in the face of the nuclear crisis, which has left numerous reactors shut down. 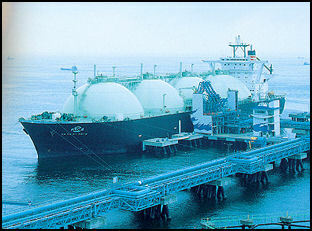 Tokyo Gas imported 10 million tons of LNG out of a total 70 million tons shipped to Japan in 2010. Major companies such as Mitsubishi Corp., Tokyo Gas Co. and Osaka Gas Co. are studying the prospect of building a large liquefied natural gas plant on the Pacific coast of Canada to tap shale gas are aimed at ensuring a stable supply of natural gas, global demand for which is rising sharply. As part of its effort to reduce its dependence on nuclear-based electric power, shale gas is increasingly looking like a good alternative especially with North America being a major source rather than areas with high geopolitical risk, such as the Middle East and Russia. Osaka Gas imports There are large undersea natural gas fields in waters claimed by both China and Japan in the East China Sea about halfway between Okinawa and the Chinese mainland. 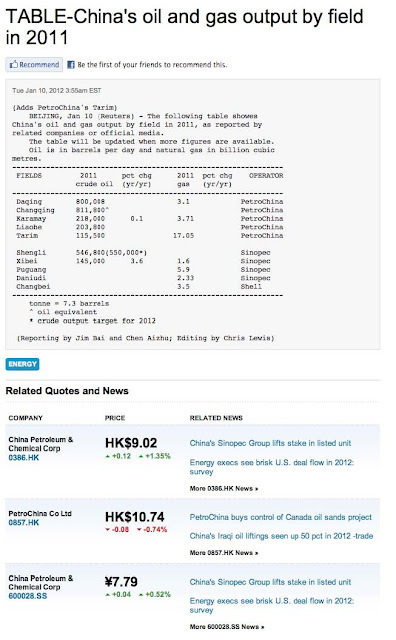 The Chunxiao and Tianwaitian natural gas fields lie in China’s exclusive economic zone. The Chunxiao field covers 8,500 square miles and holds up to 9 trillion cubic feet of gas, enough to meet China’s needs for seven years. The area is near a group of disputed islands claimed by Japan and China known as the Senkaku to the Japanese, Diaoyu to the Chinese and Tiaoyutai to the Taiwanese. The actual line of demarcation of the boundary of the exclusive economic zones (EEZ) between China and Japan is a matter of dispute. Japan wants to make a deal but China seems more intent and trying to get away with as much as it can without actually violating international law. China so far has drilled only waters in its EEZ but it has angered Japan because these areas are so close to the disputed border. According to the United Nations Convention on the Law of the Sea each coastal nation controls a an economic coastal zone that extends 200 nautical miles (230 miles, 375 kilometers) from the shoreline. The distance between Okinawa ad China is about 400 miles. Japan advocated a median line between the two countries. China advocates setting its economic border on the eastern extension of the continental shelf, a concept that pushed the border 50 miles of f the Okinawa archipelago. It seems unlike the two countries will ever agree on the line. An area of 400 square kilometers, or 150 square miles, lies at the heart of the dispute. Japan has suggested that Japan and China tap the gas fields together. Thus far China has rejected these offers. Japan has also demanded that China make pubic its survey and drilling results because two of the three major gas fields that China found are believed to extend into territory claimed by Japan. Beijing has reportedly awarded exploration right to Chinese companies to explore blocks that extend into Japan’s EEZ. Senkaku islands In June 2004, China began developing the Chunxiao site. It is now aggressively drilling at Chunxiao and Tianwaitian while Japan has yet go beyond doing geological surveys partly because the most promising areas for oil and gas are in disputed areas. China has gas production platforms less than a mile west of waters claimed by Japan. Japan claims that this platform is sucking gas from a deposit that extends over Japan’s side of the line. In 2004, China began laying 291-mile gas pipeline between Shanghai to Chunxiao. Ironically $120 million for the $1 billion project came from Japanese ad. Japan has earmarked $125 million to search for oil I the disputed area. In March 2005, the Japanese hired a Norwegian seismic ship to do surveys for oil and gas, While it was doing so it was treated as a spy ship by the Chinese and followed by Chinese ships. Japan is spending $100 million for its own seismic ship. In September 2005, Japan urged China to stop developing the disputed gas fields and called for joint exploration. In March 2006, China proposed that Japan and China jointly explore for oil and gas at one site the East China Sea together. Japan rejected the proposal. The site proposed by China is thought to be one that doesn’t contain much oil or gas. The disputed areas where gas has been found were not part of the proposal. Japan repeated its suggestion that the disputed areas should be jointly developed. China began production at the Chunxiao field in the first half of 2006. An official with CNOOC said China intends to “launch normal production operations on its own territory.” According to a CNOOC year end report for 2006 listed on its website production at Tianwaitian field was 113,267 cubic meters of natural gas a day and 42 barrels of oil a day. Production is believed to be much higher than that. No production figures were given for the Chunxiao, Canxue and Duanqiao fields. In 2008, China and Japan agreed to share the development of the Shirakaba and Asunaro gas fields. The agreement to develop the Shirakaba field was announced during a visit by Chinese President Hu Jintao to Japan. Japan has offered to provide much of the funding for joint development of natural gas deposits in the East China Sea. China is reluctant to a agree to joint development because it feels that such an agreement would invalidate China’s claim on the entire continental shelf. In June 2008, Japan and China reached an accord on developing the natural gas fields in the East China Sea, with Japan investing in a gas field already operated by China (the Chunxiao field) and the two nations jointly exploring an area not yet developed (the Asunaro gas field, which China calls the Longjing field). An agreement was not made on the Asunaro field, in part because of South Korean claims in the area. After the agreement was made Japan discovered that China was developing a natural gas field known as Tiawaitan to the Chinese and Kashi to the Japanese and lodged a complaint saying development of the site went against the sprit of the agreement. China responded by saying that it had the right to drill at the site. crude oil suppliers The State-owned Japanese oil companies Impex Corporation and Japan Petroleum Exploration (Japex) Company are the two large oil exploration companies in Japan. Japex is surveying for oil in Iraq and has invested in oil sand projects in Canada. Impex is the successor of the Japan National Oil Corporation, which has an almost unrivaled history of failure. During its 38 years of existence it engaged in 305 projects around the world, most of them yielding nothing. When it disbanded it was $7 billion in debt. Japanese companies are involved in exploring for and producing oil and natural gas in the Middle East. Japan lost the right to pump oil from a neutral zone between Kuwait and Saudi Arabia. The Tokyo-based Arabian Oil Co. had rights to drill in the Kafji oil field in Saudi Arabia until the plug was pulled on the project because Saudi Arabia wanted Japan to build a mineral-carrying railroad but Japan couldn't afford to. Japan has aggressively set up join ventures in Texas and other places to take advantage of new technologies to extract natural gas from shale. The trading houses Mitsubishi and Mitsui are involved in a number of energy projects including one to develop natural gas deposits above the Arctic Circle on the Yamal Peninsula in northwestern Siberia. By some estimates 30 percent of the world’s natural gas reserves lie in the Arctic. In February 2010, INPEX announced that had acquired development rights of part of the Orinoco oil field in eastern Venezuela. leaders of Japan and Iran Japan has a $5 billion deal with Iran and Qatar to search for and develop natural sites in the Persian Gulf. The sites are the Iranian-owned Pars South and adjacent Qatar-owned North Field, the largest and second largest gas fields in the world. Pars has 13 million cubic meters. North Field has 9.8 trillion cubic meters. Japanese efforts in Iran are hampered by U.S. restrictions on doing business there. 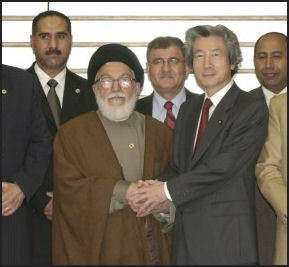 In March 2006, the United States asked Japan to suspend its plans to develop Iran’s promising Azadegan field partly to support the United States efforts to isolate Iran on the nuclear weapons issue. Japan has had problems developing the Azadegan oil field in Iran. In October 2006, Inpex, which is partly owned by the Japanese government, announced t was going to reduce its share in the Azadegan project from 75 percent to 20 percent. Stakes in Iranian fields that Japanese oil companies gave up because of political pressure from the United States have been snatched up Chinese oil companies. Several Japanese companies have contracts to develop oil fields in Iraq. Japan Petroleum Exploration and Malaysian Oil Company are working with South Oil, an Iraqi government firm, to develop a field in Garraf in southern Iraq. In June 2009 it was announced that Nippon Oil Corp. Was expected to be given the rights to develop part of the Nassiriyah oil field in southern Iraq. The plots are expected to yield 600,000 barrels of oil a day—about 10 percent of what Japan consumes each day—two years after development begins. If the deal goes through it will be the largest field developed independently by a Japanese company. Before the largest field developed was in the Khafji oil field in the Persian Gulf. Nippon Oil will develop Nassiriyah with JGS, an oil exploration company, as part of a $100 billion project that also includes construction of an oil refinery and power plant. Japan is looking to Russia for the future for its energy needs. Oil rigs near Japan could supply Japan with 250,000 barrels of oil a day. There are also large deposits in Siberia that could be directed towards Japan. There are also concerns. Russia has been aggressive and uncompromising in sales of gas to Europe. A number of Japanese energy are involved in projects in Siberia and Far East Russia. Japan Oil, Gas and Metals National Corporation (JOGMEC) is conducting feasability studies in eastern Siberian oil fields, Itochu, Marubeni, Mitsui, Mitsubishi and other are involved with Sakhalin 1 and 2. Japanese companies are sought for their expertise and money. Having them and the Japanese government involved in these projects is viewed by the Russians and others involved as a way of reducing risk and having a reliable market for its oil. The first shipment of Sakhalin-2 gas arrived in Japan in April 2009. It takes three to four days to ship LNG from Sakhalin, considerably less time than from the Middle East. About 60 percent of the gas from Sakhalin 2 is earmarked for Japan with the remainder going to te United States and South Korea. Sakhalin 2 gas will account for 7 percent of Japan’s annual gas imports an reduce its dependance on the Middle East for energy. The plan is to sell Japan five million tons of liquified gas a year for 24 years, starting in 2009. Mobile Exxon is the leading investor in the Sakhalin project. It own 30 percent. Japanese companies own 30 percent in part ensure that gas from the project ends up in Japan. There are an estimate reserves of 485 billion cubic meters in the Exxon Mobile project, enough to supply Japan’s gas needs for six years. Japan also wants to get some more of Russia’s Siberian oil. The shipping cost for Russian oil is about a third of the $1.50 a barrel it spends for shipping Middle East oil. Mitsui is negotiating with Gazprom to develop some of the worlds largest gas fields in eastern Siberia and the Barents Sea. There are hopes that a deal over oil and gas between Russian and Japan might also lead the countries to a settlement over the Kurile Island dispute which has hampered relationships between the countries since the end of World War II. In March 2008, Japan’s Natural Resources and Energy Agency made an agreement Rosneft, the Russian state-run oil company, to developed fields on Sakhalin island and eastern Siberia. Mitsubishi and Mitsui companies are likely to get stakes to the Sakhalin 3 site, which is believed to have the largest oil and gas reserve of the three Sakhalin sites. LNG from Sakhalin is transported in huge tankers with large tanks collectively able to carry 65,000 tons of LNG. The trip from Sakhalin to Tokyo Bay takes about a week. There are plans to build a 2,500-mile (4,150-kilometer) pipeline—the world’s longest—between Angrask and Taychet near Lake Baikal in eastern Siberia to the Vostochny, near the Russian port of Nakhodka on the Japan Sea, where oil would shipped by tanker to Japan. The pipeline will be the longest and most expensive ever built. If built it t would be three times longer the trans-Alaska pipeline and carry 1 million barrels a day through its 1.2 meter (four foot) in diameter pipe and increase Russia’s oil-carrying capacity by a third. It could take a decade to complete. The pipeline is expected to cost around $12 billion and has been described as the biggest project in Russia since the Trans-Siberian Railroad. The pipeline was originally supposed to cost only $6 billion but high steel prices, environmental concerns and problems presented by permafrost have pushed up the price. Japan is expected to shoulder 80 percent of the costs and get most of the oil, although a lot will be sold on the open market to any country. Work on the pipeline was due to begin in 2005, with the first section from Tayshet to Skovorodino. Near the Chinese border, to be completed by 2008. Work however was suspended in 2005 due to ecological concerns. Among them was the fate of the Amur leopard, whose territory would be bisected by the pipeline, and Lake Baikal. Work was ordered halted within 1.6 kilometers of Lake Baikal.. There are still many doubts about the project: foremost among them is whether or not there is enough oil in the Siberian fields to justify such an expensive project. As of May 2010, the pipeline between the East Siberian oil field to Vladivostok was about half done. There are plans to build a 930-mile undersea pipeline to move the gas from Sakhalin Island to Japan. The cost of the pipeline is estimated at $16 billion. Japan has not committed itself to the project. Japan needs the gas but not badly enough to justify paying such a high price. One of the main obstacles for Japan is that its fishermen wan tto be compensated for losses. The Sakhalin pipeline will cross 24 major fault lines and more than 200 salmon-spawning rivers. The oil companies have proposes building bridges over seven of the salmon streams. Russian government experts want to see 29 bridge crossings. If the pipeline were to rupture in an earthquake it could cause serious ling term damage to these streams. Both China and Japan have been courting Russia for a pipeline that would bring oil from eastern Siberia to them. In the fall of 2004, the Russian government made it clear was going go through with pipeline that help Japan, who offered Russia $7 billion in financing for the pipeline and oil development projects. The Russians prefer this pipeline anyway over the one to China because oil could be sold to a number of buyers—Japan, South Korea, maybe the United States—whereas the other deal is to a single buyer—China—and gives them too much leverage over price. The Chinese were appeased with the promise that Russia would increase its exports to China by rail by 300,000 barrels a day. There is one plan to build a branch pipeline off the pipeline from Angarsk to Nakhodka that would go to Daqing in China. The costs of the branch would be between $2.5 billion and $3 billion. This plan was given a major setback when Yukos president was jailed in June, 2003 and Japan provided Russia with lucrative financial considerations for an alternative pipeline through Siberia that bypassed China. The Japanese promised to spend $12 billion to cover construction cost and provide money for private companies for oil exploration. China has had discussions with Exxon Mobile about buying gas from their fields off Sakhalin Island, which Japan assumed was going to go to them. Exxon Mobile is somewhat angry with Japan for not moving faster to building a pipeline from Sakhalin to Japan. Disruptions on the Sakhalin projects and promises by Exxon to give China gas from Sakhalin 1 may mean that Japan gets less natural gas. thermal combined system During the 1950s, Japan relied on coal to fire its growing economy. In 1960, Japan's 600 coal mines produced 55 million tons of coal a year. Over the years companies switched to oil and imported coal. By 1979 there were only 102 coal mines left, and by 1985 only 11. Coal accounts for 23 percent of Japan’s energy consumption. Despite also its claims to be a green society and at the forefront of saving energy and reducing greenhouse gas emissions Japan burned twice as much coal in 2008 as it did in 1998. Japan (198 million tons) and South Korea (98 million tons) are the largest coal importers. Japan gets 63 percent of its coal from Australia. It also gets a lot of coal from Vietnam. Japan is a leader in producing energy-efficient, coal-power technology. With global demand for coal power expected to remain high in years to come—and with that demand for low-emission and high efficiency coal power generation also expected to remain high— producers of cutting-edge coal power generation are increasingly looking abroad for sales. Hitachi and Toshiba are finding markets for steam turbines in China and India and other countries, Electric Power Development Co., better known as J-Power, is building power plants in China. 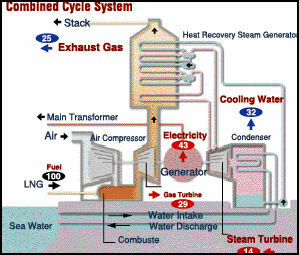 Japan is a leader in clean coal technology such as IGCC (integrated gasification combined cycle), in which coal is turned into gas to remove impurities before combustion; and IGFC (integrated gasification fuel combined cycle), in which gasified coal achieves high power generation efficiency with a triple system of fuel cells. gas turbines and steam turbine. These systems are still largely experiential at this stage yet Japan is introducing the technology to China, India and other countries. Japan effectively terminated its domestic coal production in 1990 as the high value of the yen made it much cheaper to import coal. The last coal mine, the Taiheiyo Tanko coal mine in Kushiro, Hokkaido, closed in January 2002. Located 800 meters offshore and 700 meters under the sea, it was a state-of-the-art facility that produced coal at about three times the world price. The mine couldn't compete with cheap import coal, and nationwide power plants were switching from coal to cleaner oil and natural gas. The mine closed when its $1 billion a year government subsidies were cut off. Japan imports 99 percent of its coal. 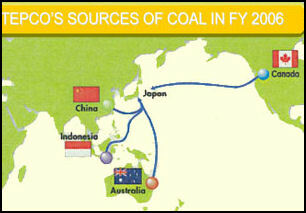 Most of Japan’s coal is imported from Australia, Canada, China and Vietnam. The amount that Japan imports is roughly equal to a forth of all the coal traded internationally. Because Japan imports many kinds of coal from man different sources it very good at evaluating the energy efficiency of different kinds of coal. Australia is Japan’s largest coal supplier, supplying it with 179.16 million tons of coal a year. This amounts 59 percent of Japan’s coal imports, which is more or less the same thing as Japan’s coal consumption since Japan doesn’t produce any coal of its own any more. An upsurge in energy prices that has spread to coal (the price of coking coal imported to Japan from Australia jumped from $100 a ton to $300 a ton between 2006 and 2007) spurred Japanese coal companies to reopen mines. Hokkaido Electric Power Company doubled its coal order in 2008 from Hokkaido mines from 500,000 to 1 million tons.